Special Offers from Discount School Supply®! : 25 Products for Under $5! If you thought our 25th Anniversary Great Giveaway and the 25% OFF sale meant the end of the festivities for Discount School Supply's celebration, then you are in for a surprise! Right now the party is in full swing at Discount School Supply with 25 products under $5! 25 Discount School Supply products under $5? Really? What can you possibly get for under $5? How about top-rated, brand name early educational supplies? That's what! Crayola® Regular Crayons - Set of 16 ONLY $1.60! Regular-sized Crayola® crayons in classic colors: set of 16 includes the classics plus blue green, blue violet, carnation pink, red orange, red violet, white, yellow green and yellow or ange. Colorations® Liquid Watercolor™ Paint, 8 oz. ONLY $2.99! 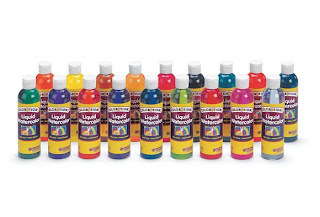 This washable water-based paint is the economical solution for classroom watercolor painting projects. Paint can be used straight from the bottle for ultimate brilliance and convenience. Use Liquid Watercolor™ on paper, wood, fabric, and filters for hours of endless fun. Pair Liquid Watercolor™ with bingo bottles, droppers, spray bottles or even just a brush to create unique designs and unforgettable artwork! Wood Clothespins - Set of 48 ONLY $3.29! Set of 48 wood clothespins 3"L each. Color with Liquid Watercolor™, marker or paint and decorate with sequins, beads, foam, wood and more! Great for making unique note clips! And these are just three of 25 products all priced under $5! Make your own 25th Anniversary celebration when you click here to see all of the products on sale for under $5. Moms, dads, teachers and caregivers: there is no time to waste. If your school, center or home needs early childhood educational products then shop Discount School Supply right now. This party won't last! Shop the 25 products for under $5 at Discount School Supply right here, right now. While you are browsing the 25 products under $5 at Discount School Supply, don't forget to check out all of the budget-friendly early education deals on Arts and Crafts, Furniture, Manipulatives, Curriculum Resources, Active Play, Dramatic Play and more exclusively at Discount School Supply. Visit Discount School Supply and shop today!